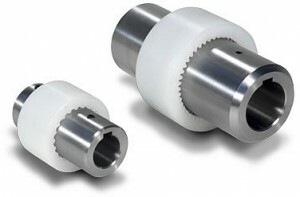 GN couplings are made up of two toothed steel bushings, connected by a nylon ring with internal toothing. A snap ring at the centre of the hole prevents axial displacement. GN couplings are only available with shaft grooves (hole, key and dowel) machined to the sizes listed in the table. GN couplings are recommended for transmission of moderate torques at high speed rates (input shafts). The maximum allowed ambient temperature is 70°C.